The second round of the 2018-19 Ranji Trophy finished on Thursday, and out of the 17 matches played, eight resulted in outright wins. The percentage of wins in the Elite groups improved significantly in this round. While in the first round there were just three outright results across three elite groups in 13 matches, the second round saw six such results in the same number of matches. Two out of four matches in the Plate group ended in draws in the second round, unlike the first round where all four matches had resulted in outright wins. Group A (Elite) saw eight of nine teams in action: Baroda vs Maharashtra, Gujarat vs Chhattisgarh, Saurashtra vs Railways and defending champions Vidarbha vs Karnataka. Except for the Saurashtra vs Railways game where the former won by three wickets, the rest of the matches ended in draws. However, Baroda, Gujarat and Karnataka got two extra points on the basis of their first-innings lead. Saurashtra and Gujarat claimed the first two places in the group with 9 points from two games. Group B (Elite) witnessed four matches: Bengal vs Madhya Pradesh, Delhi vs Himachal Pradesh, Kerala vs Andhra and Tamil Nadu vs Hyderabad. Playing at home, Kerala beat Andhra convincingly by nine wickets to claim the only outright win in the group as the rest of the matches ended in a draw. However, Bengal and Delhi walked out of the match with two extra points. In the Tamil Nadu-Hyderabad game, both teams got one point each as TN, at 409/4, had not been able to finish their first innings in their reply to Hyderabad’s 565/8 declared. Kerala and Bengal, on seven and six points respectively, took the first two spots in the group. Group C, like in the first round, yielded maximum results. Out of five matches, four resulted in outright wins with Assam, Rajasthan, Uttar Pradesh and Jharkhand registering victories over Tripura, Services, Odisha and Haryana. The only match which ended in a draw was played between Goa and Jammu and Kashmir where the former gathered three points courtesy their first innings lead. With two outright wins each, Uttar Pradesh and Rajasthan grabbed the first two places in the group. There were four matches played in the Plate Group and two yielded results. Sikkim and Uttarakhand won their matches against Nagaland and Manipur. Mizoram vs Arunachal Pradesh and Puducherry vs Meghalaya, both ended in a draw with Arunachal and Puducherry getting two extra points on the basis of their first innings lead. With two outright wins each, Sikkim and Uttarakhand took the top two places in the group. 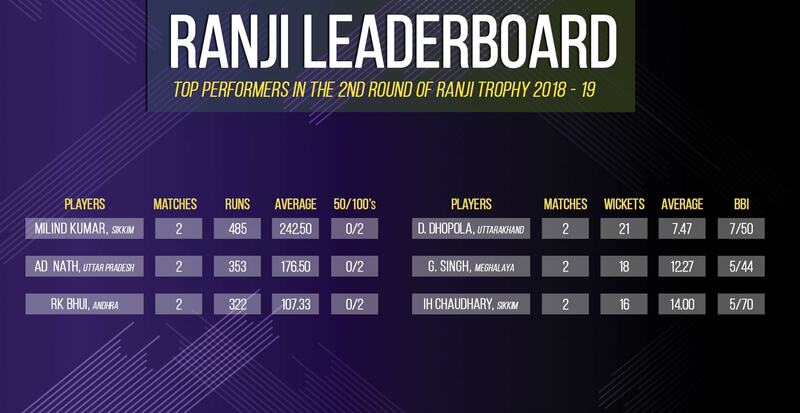 After the completion of Round 2, Sikkim’s Milind Kumar (485 runs at an average of 242.50), Uttar Pradesh’s AD Nath (353 at 176.50) and Andhra’s Ricky Bhui (322 at 107.33) are the top three batsmen on the leaderboard. On the bowling front, Deepak Dhopola (Uttarakhand), Gurinder Singh (Meghalaya) and Ishwar Chaudhary (Sikkim) find themselves holding the first three spots with 21, 18 and 16 wickets respectively. The third round of the hallowed domestic competition starts on November 20.